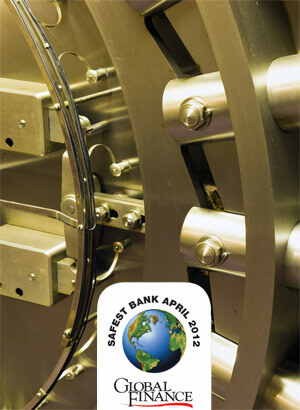 Global Finance presents a half-year update to its annual ranking of The World’s Safest Banks. The safest banks in the world are still European banks, despite the crisis in the eurozone, but their continued dominance is under threat from the likelihood of multi-notch downgrades in the months ahead. European banks fill the top 10 places in Global Finance’s midyear update on our annual rankings, just as they did the last time the rankings were published, in October 2011. And although they have slipped slightly, they still account for roughly half of the top 50. The updated listing of the World’s Safest Banks is based on ratings assigned by the three major credit rating agencies on February 22, 2012—after a series of downgrades by Fitch Ratings and S&P but before Moody’s completed the reviews for downgrade that it announced on February 15. The biggest casualties in Europe have been banks in Spain and Italy, which have seen downgrades by all three agencies in recent months, but British and French banks have also been affected. Banco Santander, which ranked 10th in last year’s list with an average rating of AA, fell to the bottom of the list—it now has an average rating of A+. BBVA, ranked 17 last year, and Banesto, ranked 32, have dropped out of the top 50. Cassa Depositi e Prestiti, ranked 31 last year, and Intesa Sanpaolo, ranked 37, now with low single A ratings, have fallen far below the qualified standards. Only four banks in the world now hold AAA ratings from all three agencies: Caisse de Dépots et de Consignations lost its AAA from S&P in January. Rabobank fell to eighth place from sixth after downgrades from both Fitch and S&P, but it remains the highest ranked bank that does not benefit from some form of privileged relationship from national or regional bodies in its home country. Overall, the quality of banks’ ratings has not fallen greatly since September. The average score for banks in the top 50 was 22.8 in September 2011, and 22.6 in February 2012—roughly equivalent to two AA ratings and one AA-. The average quality was helped by rating upgrades to several banks —eight scored more highly than in September (see separate box). An average rating of A+ from all three agencies was the minimum needed to stand a chance of inclusion in the latest top 50. Twelve North American banks grace the top 50, although Wells Fargo falls out of the list, and National Bank of Canada comes in. Canada now holds six of the top 10 spots in North America—up from five in the previous ranking. Bank of New York Mellon retains its position as the highest-ranked US Bank, in 26th place. Changes to S&P’s bank rating methodology, published in November 2011, have had a significant impact on several banks’ ratings. The ratings of many large international banks were lowered, but two Singaporean banks benefited: Oversea-Chinese Banking Corp and United Overseas Bank both received a one-notch upgrade, putting them on the same rank as DBS Bank. All three have moved up the rankings since last year: DBS from 19th to 15th, Oversea-China from 25th to 16th and United Overseas from 26th to 17th. Fitch lowered the ratings of some large European banks in December and early February, and on February 15, Moody’s announced rating actions on 114 financial institutions in 16 European countries. The same day it announced rating actions on six large North American banks. In many cases, Moody’s indicated the possibility of multi-notch downgrades. Two- or three-notch downgrades from Moody’s will likely result in several major international banks losing their places to banks based in the Gulf. Qatar National Bank and Samba Financial Group have already joined National Bank of Abu Dhabi and National Bank of Kuwait in the top 50, and other high-scoring Gulf banks are waiting in the wings. Banco del Estado de Chile is the only Latin American Bank to be included in the top 50, tying for 46th place with Shizuoka Bank of Japan. Central and Eastern European banks still fall short of the rating levels required to be included in the global list. The safest banks list compares the ratings for the world’s largest 500 banks, based on asset size. Long-term foreign currency ratings issued by Fitch Ratings, Standard & Poor’s and Moody’s Investors’ Service were used. Banks rated by only one of the three agencies were ineligible for inclusion. Banks that are 100% owned by a parent in a developed market were omitted. Government import-export banks were also omitted. Within each rank set, banks were ordered by asset size based on year-end 2010 data supplied by Fitch Solutions and Moody’s. A tie is assigned when two banks with the same score have total assets within a $5 billion range. 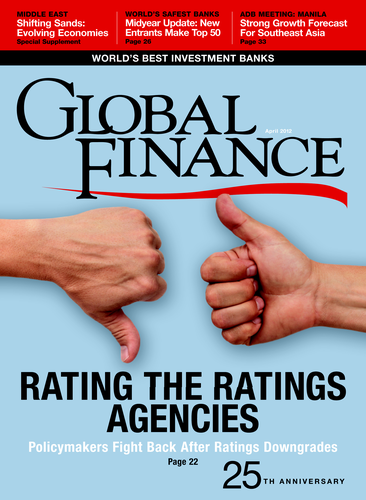 Ratings are reproduced with permission from the three rating agencies with all rights reserved. A rating is not a recommendation to purchase, sell or hold a security, and it does not comment on market price or suitability for a particular investor. Although many developed market banks faced downgrades, a number of banks in both emerging and developed markets improved their balance sheet strength—and profited by being upgraded by one or more of the three main rating agencies. Four banks in the global safest 50 list, and four that qualified for the regional listings, hold higher scores now than they did in August 2011. Oversea-Chinese Bank and United Overseas Bank, both of Singapore, benefited from a global review by S&P of its bank-rating methodology, which led to several upgrades of Chinese and Asian banks. In contrast, DZ Bank’s upgrade from S&P came after a review of the German cooperative bank sector. Australia’s Bendigo and Adelaide Bank was upgraded despite S&P’s decision to downgrade the country’s four major banks.